I’ll admit there’s probably something wrong with me that I care this much about two $15 light bulbs. And the old me a few years ago would cringe at spending $15 on a light bulb. But there you have it. Here’s my readings for energy consumption measured using a Kill-A-Watt. I’m surprised that the bulbs draw 0.4 Watts when they’re in the off state (powered on, but no light output). Most of that is wasted power used to convert AC to the tiny amount of DC current needed for the zigbee microcontroller. Let’s assume we’re running a bulb for 5 hours a day at $0.08 per kWH electricity cost. 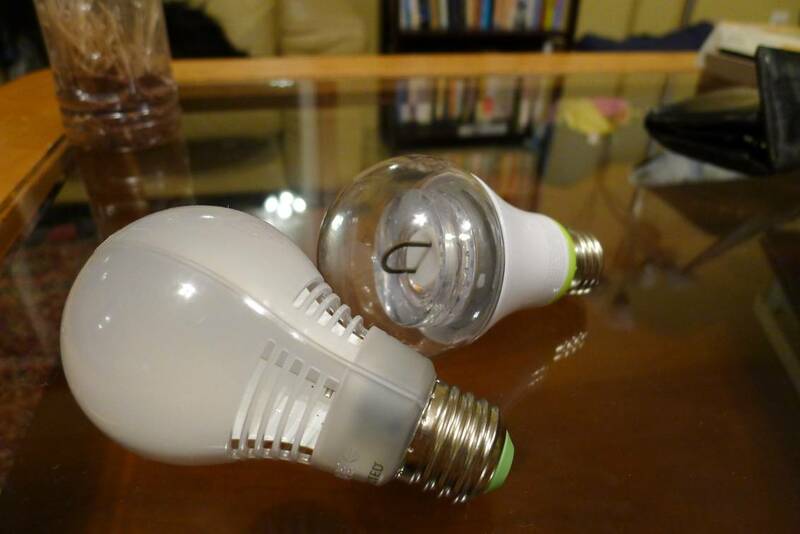 A 60W incandescent would cost $8.70 per year, while these LED’s would cost $1.7 per year. The LED bulbs also have a much longer life expectancy, 25000 hours compared to 2000 hours for incandescent. Even if we halve the listed life expectancy for the LED’s to 12000 hours, that’s over six years bulb life. Over that six years, you’ll spend $42 less in electricity when using LEDs. When CFL bulbs first came out, they had horrible life expectancy. Mostly I think because of the power electronics (probably capacitors) getting hot and failing over time. But they got much better, and I’ve had CFL bulbs in my living room (highest usage case) that’s lasted six years. It’s not too much of a stretch to believe that the component longevity would extend to these LED bulbs. The color temperature looks the same to me, and they’re both rated at 2700k. You can decide for yourself in the photos later. They’re all taken at 4200k white balance on a Canon DSLR (just happen to be at that setting for all the pictures). I should’ve set the color balance on the camera to 2700. Once I started, I wanted to keep all the settings the same, so I just left it as is. As a result, the pictures look really red, but that’s my fault. They’re both nice looking bulbs, and the 2700k rating is about right. I don’t have anything fancy to measure color rendering. They look sameish for CRI. You can decide for yourself. This is with the bulbs turned on manually, so they should be at the highest setting. I took all these photos at these settings. To my eyes, both bulbs have about the same low level. The frosted lens on the Cree spreads the light a little differently than the GE, but they look the same if you’re sitting in the room looking around. I wish the bulbs could dim even lower. They’re much too bright as a night light. The low setting is bright enough to let you spot things on the floor before tripping over them. One note about the low settings. I’m using aprontest on the GE Links to set the low to level=1. On the Cree, I was using the Wink app, which seem to set the low to level=3. Hoping that’s negligible since the value ranges from 1-255. Cree aprontest actually at level=3. I appreciate the comparison because I was just considering the Cree vs GE for some new bulbs. Only complaint, though… You invalidated the comparisons of visible light levels and power consumptions by dimming the two bulbs to different levels (aprontest vs Wink App). Can I respectfully suggest the comparison should be redone to only include settings from the app? Showing the levels available in aprontest could be useful too, but to a far smaller audience than Wink app performance. Well…I don’t know if it’s “invalidated”. I did try again to see if there’s a measurable difference between level=3 and level=1 on the Kill-a-watt, and it didn’t make much of a difference, the reading was poping between 1.3 and 1.2. Visually, I can see some change in lumens if I’m staring at the bulb, but it’s very slight, and I’m not always able to tell which was the brighter setting, just that there was some change while the bulb’s electronics adjusted. The Wink app behaves the same on the GE bulbs as on the Cree – the lowest setting is level=3. There’s a slight difference between level=3 and 1 on the GE too…small enough that I see a change most of the time, but it’s very slight. I won’t redo the photos though, too lazy. I’ll just have to live with the inconsistency on this blog. I’m sorry, that came out a little harsh. Thanks for the updated info, I can understand about skipping the pics. I just looked up the details on both of these and neither one can be used in enclosed fixtures, what a bummer! Normal Cree LED’s work in enclosed fixtures but not the connected ones. Why?!? Dunno about the Crees, but the GE Links run fairly hot.. Hate what that says about efficiencies. Anyway – I’d guess that heat dissipation is the reason to avoid enclosed fixtures. 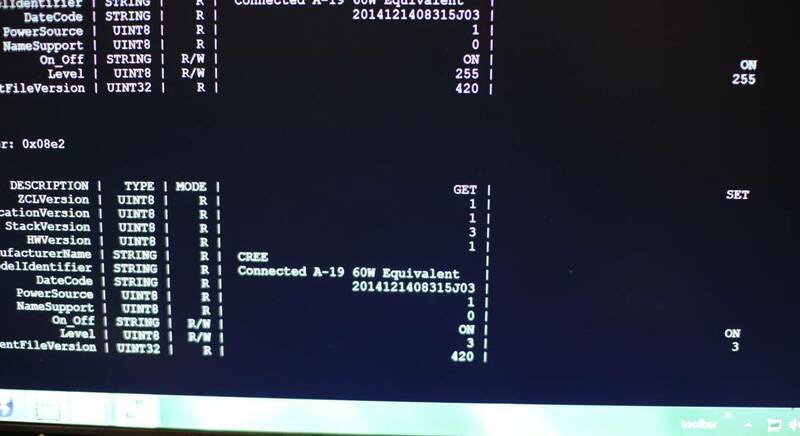 Why the connected Cree would be that much warmer.. Doesn’t make much sense, especially considering the off/idle power consumption posted above. The radio simple doesn’t consume that much additional power. It may be that heat production is similar, but the radio is more susceptible to heat damage. Yeah, the Zigbee radios probably have a certain environmental spec. These are microcontrollers inside the bulb, so they’re more sensitive than just having diodes, caps, and resistors. I’ve read that housing even the non-connected LEDs inside enclosed fixtures will decrease the life of the bulb. This may just be my two cents but I have both the GE Link and Creed Connected bulbs. The difference in heat output is large, a 60 W GE feels as hot as a 100 W incandescent bulb where the Crees do produce heat but you are not going to burn off your finger prints if you need to take one out that was just on. I think this is where the watt meter can provide more objective measurement than your hands. The amount of heat generated by the bulb is summed up by the reading on the kill-a-watt meter. What you feel with your hand is a result of the heat transfer properties of the material. It’s probably not a good measure of the energy efficiency of the bulbs, or even heat generation.